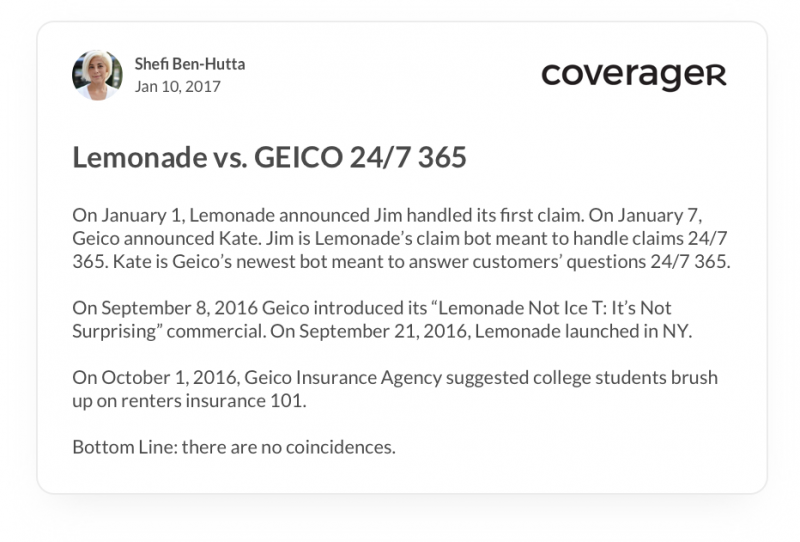 As though timed to perfection, GEICO’s launch of their “Lemonade” TV commercial coincided with Lemonade’s commercial launch. Either the gods were conspiring against us, we thought, or the execs at GEICO were. We chalked that one up to the gods. 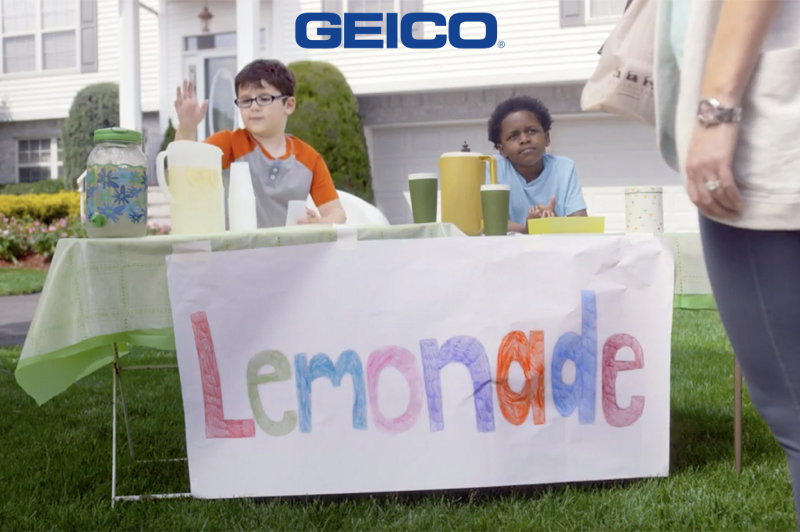 After all, the agenda of big GEICO couldn’t possibly be dictated by a little Lemonade, right? 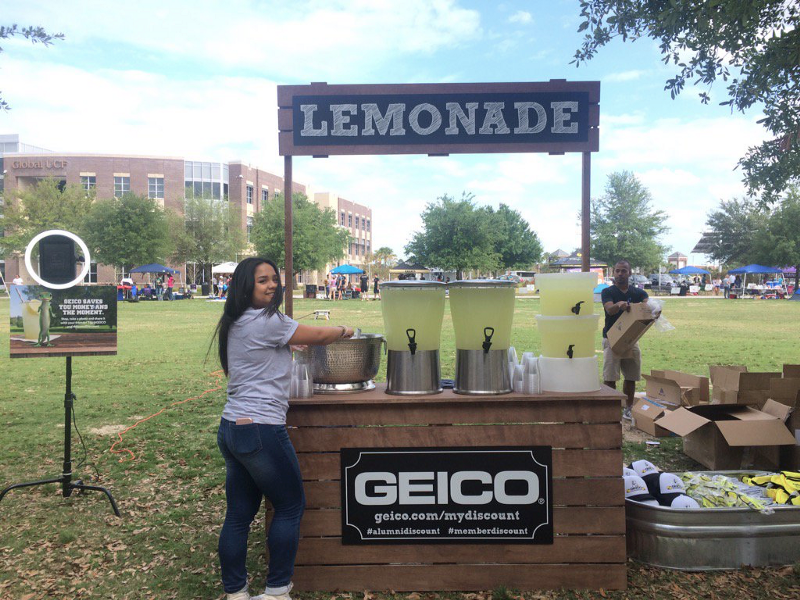 No sooner had we made our peace with the commercial, than GEICO started using lemonade to market to millennials, our core demographic. Once again, we figured this was a chance encounter. After all, who doesn’t like a little lemonade, right? 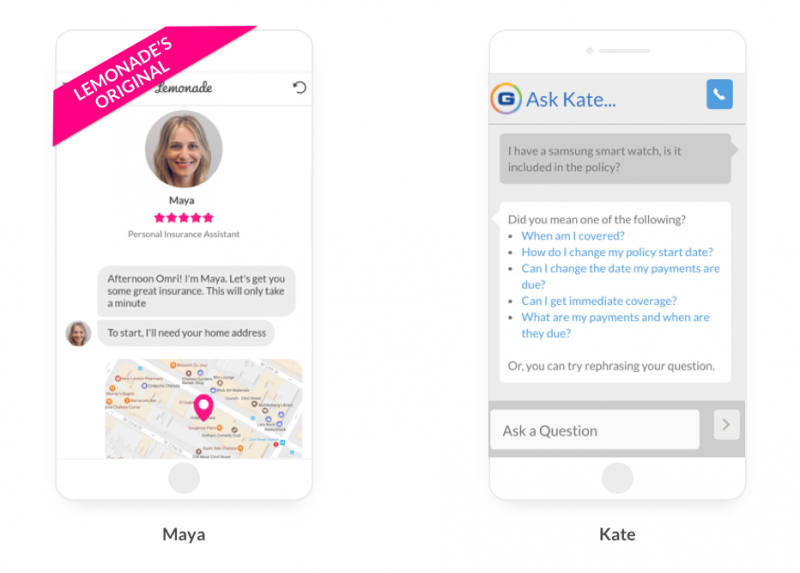 Then GEICO introduced ‘Kate’, their attempt at a chatbot. But despite putting in a good effort, GEICO is not our #1 doppelganger this year. A fluke? Perhaps. But while some of the lemonade-esque displays may be mere chance, others – as we’re about to see – clearly aren’t. 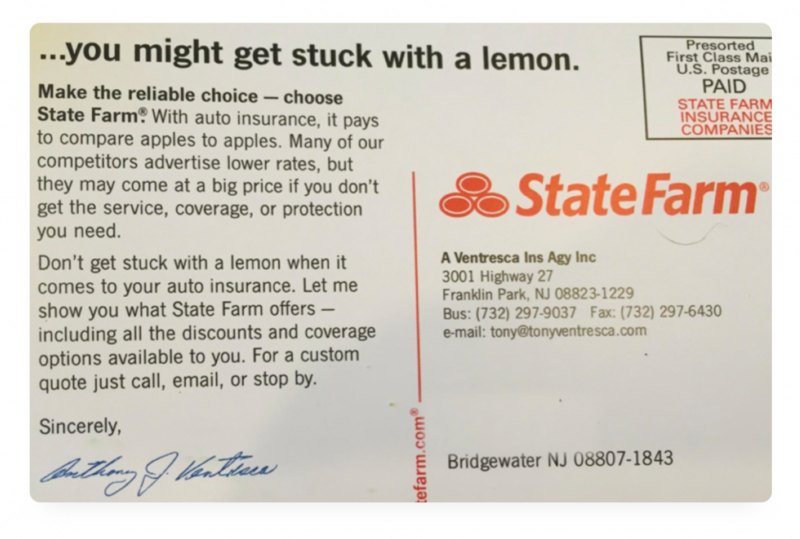 At the end of the day, our search for the ‘#1 Lemonade-Copycat’ produced a clear winner: Liberty Mutual. 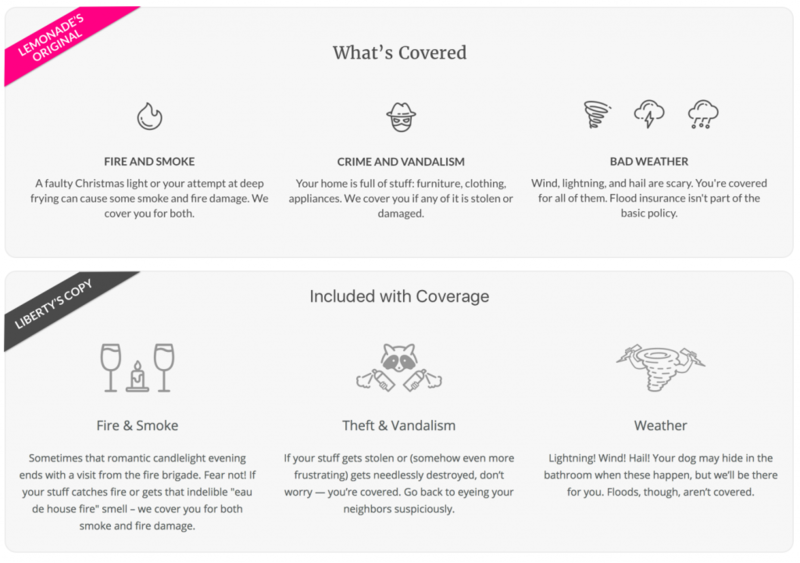 They earned the title for “Lulo,” their new brand – and total Lemonade knockoff – tasked with talking renters insurance to millennials. A citrusy fruit for a name, a look-alike logo, paraphrased content, copycat pricing. I mean, we’re flattered and all, but take a look at the logos above and screenshots below. Isn’t this a little embarrassing for you guys? If you didn’t already, take a minute to play ‘spot the difference’; it’ll bring a smile to your face (or at least a grimace). Don’t get me wrong. 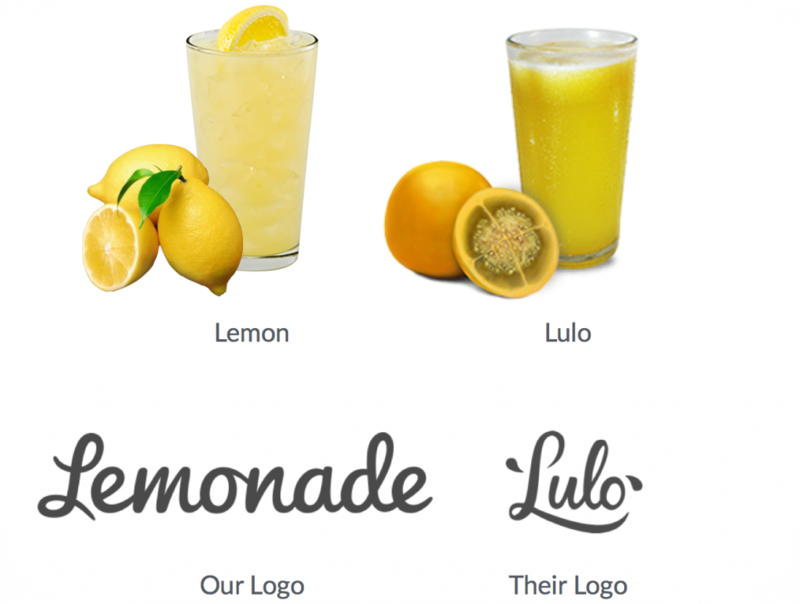 The idea that Lemonade might trigger incumbents to up their game thrills us. 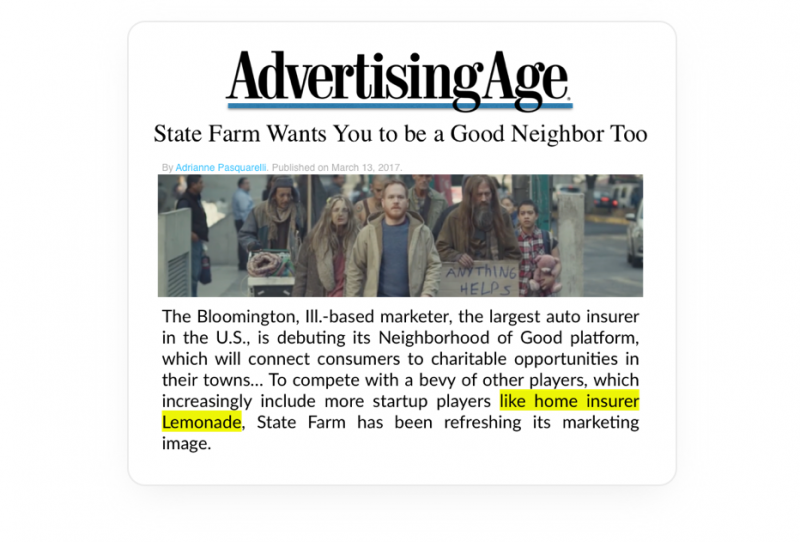 Allstate’s leadership were shown the video of Lemonade paying a claim in 3 seconds, and were told that this set a new bar for the industry. We love that and respect them for it. 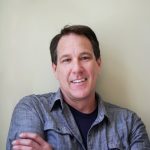 If we play even a modest role in encouraging others to increase innovation, reduce conflicts of interest, expedite claims, up transparency, or give back to the community, we couldn’t be happier. It isn’t that copycats are a threat either. If ‘cloning’ Lemonade is their strategy for competing with us, that means we get to play to our strengths, while they’re stuck playing catch-up. That works for us. And yet, I wince at blatant attempts to mimic Lemonade. It’s like the feeling you get when your parents try to use contemporary slang with your friends. You shift uncomfortably, look at your feet, and pray it will stop. The flaw in their thinking is obvious. Apple’s name was the outermost expression of a profoundly different kind of company. Apple was ‘thinking different,’ and their name was an authentic expression of that. Rebranding ‘Applied Computer Techniques’ as ‘Apricot’ isn’t thinking different. It’s a transparent attempt to parrot someone else, the textbook definition of thinking the same. Apricot’s copying was the antithesis of Apple’s innovation. Consumers can spot the difference between an Apple and an Apricot a mile off. Our competitors are distinguished companies, with a rich heritage, good people, and mountains of cash. If they dedicate these to authentic innovation, consumers will reward them for it. If they don’t, they won’t. Copying Lemonade is fair game, I’ll give them that. But it isn’t the smart play.